As a world leader in quiet air compressor manufacturing, Silentaire Technology aims at ensuring the best working experience with their products. In order to meet ongoing challenges and to deliver only quality and high-end compressed air solutions, like this Silentaire Val-Air 50-15 AL, the company constantly carries out researches and pays a special attention to the suggestions and requests from their customers. That's why all of Silentaire compressor are designed and developed in view of high capacity, effectiveness, but herewith a low noise level. With regard to the Val-Air line of Silentaire compressors, mention is usually made of their silent running and completely automatic operation. For users, these are very helpful features. The first allows you to work in peace and simply enjoy the airbrushing process without being distracted by noisy compressor work. 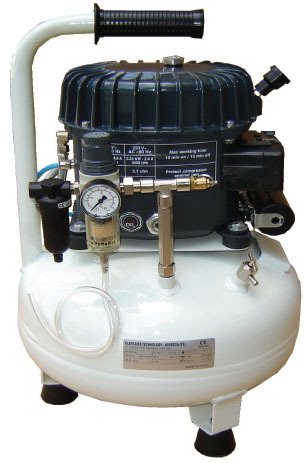 While the other gives you a freedom from the constant control of the air pressure within the compressor tank. Due to a pressure switch, the air pressure cannot exceed its maximum level as it automatically stops the motor. When the pressure decreases to the minimum value, the switch starts the motor again. a handle or wheels ensuring added portability. Besides, all Val-Air compressors have been upgraded with "AL" heavy-duty 1/2 HP pumps that feature aluminum heads with cooling fins. This compressor model is very popular with professional airbrush artists due to a consistent air pressure and smooth paint application. Beyond that, the unit has an in-line coalescing filter providing even better spraying while eliminating oil mist and preventing rust. An additional point is that this Val-Air 50-15 AL Compressor can be a nice fit if you work in multiple locations. With its weight of 51 lbs, the compressor is quite portable. To make its carrying and transport even easier, the manufacturer added a comfortable carrying handle and wheels. What is more, the packing contains an oil bottle type ROLOIL - SINCOM/32E, instruction manual, and a tank certificate. The Silentaire Val-Air 50-15 AL Compressor comes with a standard 1-year warranty from the manufacturer. The period of the guarantee validity starts from the date of purchase. This covers a free repair and replacement of parts recognized as defective by the manufacturer. However, the electric compressor parts and worn parts are not under the guarantee. Please, also note that tampering or bad usage will automatically terminate your rights under this guarantee.